Our team and one of our volunteers, lovely Susann from Germany, working in the permaculture gardens, and bringing bamboo leaves to the compost. After the work is done, we are all eating together with our team. The food was prepared by the wife of Wira on occasion of her sons coming of of age at 12 years ceremony. Two of our three Balinese dogs, Angrek and Blackie, are looking on. Today we want to share our favourite Balinese Tofu recipe with you. 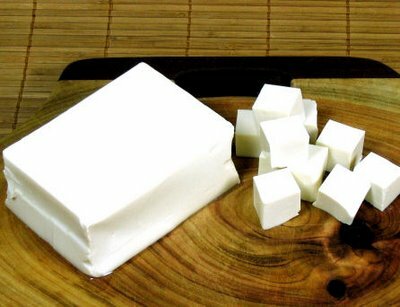 Tofu or bean curd is a food made by coagulating soy milk and then pressing the resulting curds into soft white blocks. Tofu has very little flavor or smell on its own, so it can be used either in savory or sweet dishes, and it is often seasoned or marinated to suit the dish. Tofu contains a low amount of calories, relatively large amount of iron, and little fat. Depending on the coagulant used in manufacturing, the tofu may also be high in calcium and/or magnesium. Approx. 4 leaves Daun Salam, an Indonesian Bay-Leaf. If you cannot attain Daun Salam you can substitute with ordinary bay-leaves, though the taste will be different. 4 pieces of Kemirie Nuts. This Indonesian nut looks like a large hazelnut. Astri uses it to thicken and flavor the Kare Tofu sauce. You can substitute with Macadamia or Brazil nuts. A pinch of Ketumbar, or coriander spice. Preparation: First, make the sauce. Add the Kemirie, chopped garlic, minced red onion, turmeric, Ketumbar and sugar together in blender (a bullet is useful here). Cut tofu into triangles. Heat a couple tablespoons of vegetable oil in the wok enough to coat the pan and give partially cover tofu. Once hot, add tofu. Give the lemongrass a couple of pounds with mortar and pestle and then add the entire stalk into the skillet. Add Daun Salam. Let simmer for 5 to 10 minutes. Add sauce and stir. Next, add water. The mixture should look almost soupy. Add vegetable sock. Bring the tofu and sauce to a boil for about 15 minutes. Reduce heat, allow to continue cooking and reducing for 2 or 3 minutes. Take off heat and add Santan Kelapa. Stir and let stand. Give sauce adequate time to cool and thicken around the tofu. We are lucky enough to enjoy salad from our organic garden on a daily basis. We currently grow two different types of lettuce, arugula, basil, cucumber, tomato, and carrot. All combine for a fantastic mixed greens salad.Astri makes a wonderful salad dressing to go with our fresh greens. This dressing recipe is simple, quick, and easy to make at home. Juice from 4 to 5 limes. Combine all ingredients and stir until smooth and well blended. This light and flavorful dressing does not overstep its bounds and mask the many tastes of vegetables. It lends itself softly and combines nicely with any salad. Enjoy!